Like ordinary grout, SPEC MIX SCG should be installed in accordance with the provisions of the local building code, ICC, MSJC, and The American Concrete Institute’s requirements and specifications ACI 530/530.1 Building Code Requirements for Masonry Structures and Specification for Masonry Structures. SPEC MIX SCG may be used in both low-lift and high-lift applications. Special consideration should be used in selecting the type of grout used for a particular application. (See ACI 530-05 table 1.16.1) SPEC MIX SCG may be placed by hand or by mechanical delivery. As a licensed SPEC MIX manufacturer, PACKAGE PAVEMENT certifies that our grout products are designed to meet ASTM property requirements for core fill grout. A digital print out displaying proper proportions of each batch may be kept as a permanent record before the SCG is completely preblended and packaged in the appropriate size bag. 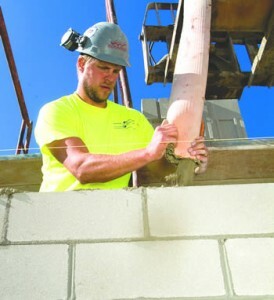 SPEC MIX SCG is accepted for all types of masonry construction with submittals available upon request. A dry preblended core fill grout designed to be highly fluid without segregation when placing into masonry units. Available in Coarse and Fine.